The season-opening NFL game in San Francisco on September 6, 1998 featured the 49ers, a perennial contender, hosting the New York Jets, a team that was on the rise. The 49ers were a savvy veteran club that was used to winning, having been to the postseason in each of the previous six seasons and 16 of the past 18 years. Steve Mariucci had taken over as head coach in 1997 and the result was a conference-best 13-3 record and an appearance in the NFC Championship game. 36-year-old QB Steve Young routinely won passing titles, and while there were concerns that he could no longer deliver the long ball, the return of star WR Jerry Rice, who was lost for the year in the first week of ‘97, was expected to help, even coming off of two knee surgeries. New York was just two years removed from a dreadful 1-15 campaign in 1996 but had perked up considerably to 9-7 in the first year under Head Coach Bill Parcells. 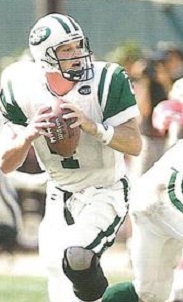 QB Glenn Foley, taking over for the departed Neil O’Donnell, brought a gunslinger attitude to the offense but was also inexperienced, and underachieving veteran QB Vinny Testaverde was signed during the offseason. RB Curtis Martin was obtained from New England, where he had previously played with distinction under Parcells, and there was a young pass receiving corps led by brash WR Keyshawn Johnson. The team was in rebuilding mode but appeared poised to move up. There were 64,419 fans in attendance on an unseasonably warm day at 3Com Park. The 49ers had the game’s first possession but turned the ball over when a pass by Steve Young was intercepted by FS Kevin Williams, who returned it 34 yards to the San Francisco 27. 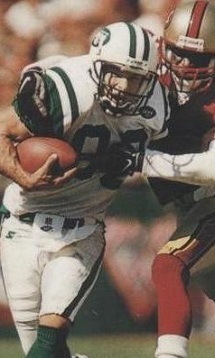 Glenn Foley (pictured at right) completed two passes to Keyshawn Johnson and John Hall kicked a 24-yard field goal to give the Jets the early lead. The teams exchanged punts before San Francisco put together an 84-yard drive in eight plays. Young completed four passes along the way, with the longest to WR Terrell Owens for 23 yards, and RB Garrison Hearst (pictured at top) capped the series with a five-yard touchdown run up the middle. Wade Richey kicked the extra point and the home team was ahead by 7-3. The Jets had the ball for the remainder of the opening period, but on the first play of the second quarter CB Antonio Langham picked off a Foley pass to give the 49ers possession at the New York 48. Hearst burst up the middle for 19 yards on first down, but three consecutive incomplete passes forced a long field goal try by Richey, and his 47-yard attempt missed the mark. Seven plays later, Foley connected with Johnson for a 41-yard TD and, with Hall’s point after, the visitors were back on top by 10-7. The teams again traded punts before the 49ers put together a seven-play, 63-yard scoring drive. Young threw to WR J.J. Stokes for 25 yards and followed up with a completion to FB Marc Edwards for 16 yards to reach the New York 17. The drive bogged down but a defensive holding penalty on a third-and-six play gave the Niners a first down at the eight and, two plays later, it was Young to Stokes for a six-yard touchdown. Richey’s conversion had San Francisco ahead by 14-10. 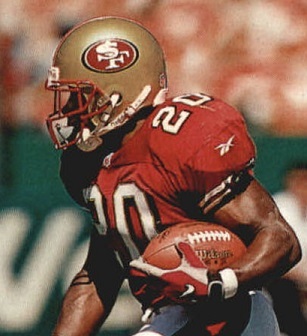 There were still two minutes remaining in the first half following RB Leon Johnson’s 33-yard kickoff return, and Foley fired passes to WR Dedric Ward for 19 yards and Keyshawn Johnson for nine to reach the San Francisco 32. The Jets got a break when an interception was nullified by a penalty on the 49ers and, three plays later, Foley tossed a pass to WR Wayne Chrebet for a six-yard TD with 37 seconds left on the clock. Hall booted the extra point and, in see-saw fashion, the Jets took a 17-14 lead into halftime. Following a possession by the Jets that concluded with a punt to start the third quarter, the 49ers tied the score with a 38-yard drive in seven plays that ended with a Richey field goal from 22 yards. However, New York came right back when, on the first play of the next series, Foley threw to Chrebet for a 48-yard gain to the San Francisco 30. Three plays later, with a roughing-the-passer penalty mixed in to move the Jets closer, Foley connected with Keyshawn Johnson for a 21-yard touchdown and, with Hall providing the extra point, the visitors were up by 24-17. The 49ers responded with a 68-yard series in seven plays that featured Young completing consecutive passes to Owens for 19 yards and WR Jerry Rice for 21. Facing fourth-and-one at the New York 14, it was Young to Rice for a TD but the extra point attempt was blocked by DT Jason Ferguson and New York remained in the lead by a point. The Jets had the ball in a possession that extended into the fourth quarter. Foley threw to Curtis Martin for 18 yards and to Chrebet twice, once for eight yards in a third-and-seven situation and then for 22 to get the ball to the San Francisco 29. But New York came up empty when the drive stalled and Hall missed a 45-yard field goal attempt. The teams exchanged punts before the Jets advanced to another score. Foley completed passes to Martin for 22 yards, Keyshawn Johnson for 14, and Chrebet for 22 and, after Martin ran twice to get to the San Francisco 14, Hall booted a 32-yard field goal to make the score 27-23. After the ensuing kickoff, the 49ers took possession with 3:38 remaining in regulation. On first down, Young passed to Hearst for a 35-yard gain to the New York 41. Four plays later, it was Young to Stokes (pictured at left), who out-jumped Kevin Williams and dove into the end zone for a 31-yard touchdown and, with Richey making the extra point, the Niners were in the lead by three points at 30-27 with the clock down to 1:32. There was still time for the Jets, and they drove 60 yards in 12 plays. Foley converted a third-and-ten play with a throw to Chrebet for 19 yards and a fourth-and-ten situation with a toss to Ward for 22 to the San Francisco 32. Another pass to Ward on third down picked up 19 yards and, as time expired, Hall booted a 31-yard field goal to make it 30-30 and send the contest into overtime. The Jets had the ball first in the extra period but went three-and-out. CB R.W. McQuarters returned Nick Gallery’s punt 16 yards to give San Francisco good field position at the New York 43, but the 49ers were unable to move and punted in return. The visitors, helped by a face mask penalty, drove to their 47 before having to punt again, and Gallery’s 49-yard kick had the 49ers taking possession at their four yard line. But on the next play, Hearst broke away off right tackle, stiff-armed Williams at the 20, and was off to the races for a 96-yard touchdown run, reaching the end zone just ahead of LB Mo Lewis’ desperation tackle. In stunning fashion, San Francisco came away the winner by a final score of 36-30. The teams combined for 1003 yards, with the 49ers having the edge (557 to 465) as well as in first downs (26 to 25). New York, whose yardage total was its most in eight years, led in time of possession (34:43 to 29:25). Each club turned the ball over once. Steve Young completed 26 of 46 passes for 363 yards and three touchdowns while giving up one interception. Boosted by the game-winning run that was the longest in franchise history, Garrison Hearst accumulated 187 yards on 20 carries that included two TDs. 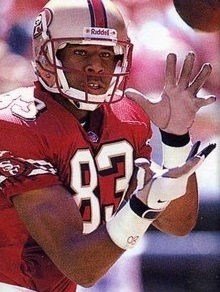 J.J. Stokes had 7 catches for 111 yards and two touchdowns and Jerry Rice pulled in 6 passes for 86 yards and a score. For the Jets, Glenn Foley had a career day as he succeeded on 30 of 58 throws for 415 yards and three TDs with one interception. There were two receivers with over a hundred yards led by Keyshawn Johnson, who caught 9 passes for 126 yards and two touchdowns, along with Wayne Chrebet (pictured at right) with 6 receptions for 125 yards and a TD. Dedric Ward was four yards short of the century mark as he gained 96 yards on five catches. Curtis Martin had a fairly quiet rushing day, gaining 58 yards on 22 attempts, but also had four pass receptions for 41 yards. San Francisco went on to a 12-4 record that placed second in the NFC West and qualified for a Wild Card playoff spot. The 49ers defeated Green Bay in the first round before falling to Atlanta at the Divisional level. The Jets were a bigger surprise in also going 12-4 and topping the AFC East. They reached the AFC Championship game before finally succumbing to the Denver Broncos. Steve Young had another stellar year, passing for a career-high 4170 yards and a league-leading 36 touchdowns. He was chosen to a seventh straight Pro Bowl, his last. Garrison Hearst went on to gain 1570 yards on 310 carries with seven TDs and was also a Pro Bowl selection for the first time. J.J. Stokes achieved career bests with 63 pass receptions for 770 yards and eight touchdowns and Jerry Rice returned to Pro Bowl form as he caught 82 passes for 1157 yards and nine TDs. For Glenn Foley, the big opening performance against the 49ers proved to be the highlight of his season. Two lackluster starts while also being sidelined with a rib injury in between caused him to be relegated to the bench in favor of Vinny Testaverde, who put together a Pro Bowl year in quarterbacking the Jets to the postseason.